Robert Sheckley was born in 1928 and grew up in New Jersey. As a child he became fascinated with what he now calls "escape literature". He grew up in New York and New Jersey, and served in Korea with the U.S. Army. In 1951 he received an undergraduate degree from New York University and sold his first short story. Writers who inspired him include Ray Bradbury, Theodore Sturgeon and Henry Kuttner. He sold his first story in 1951. During the 1950s the science fiction market was booming, with dozens of magazines competing with each other. The prolific young author took advantage and quickly became a major force in the genre. A huge number of his short stories appeared in magazines including Amazing, Astounding, If, and Fantasy & Science Fiction. His most frequent contributions were to Galaxy, sometimes using pseudonyms to disguise the fact he had written more than one story in a particular issue. 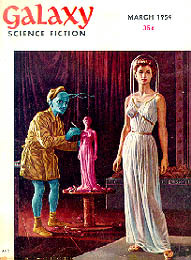 His first collection of stories, Untouched By Human Hands (1954), was hailed as one of the finest debut volumes in the field. Other exceptional collections from this era include "Citizen in Space" (1955) and Store of Infinity (1960). Several of his early stories were also broadcast on the radio show X Minus One. By the 1960's the science fiction magazines were in decline, replaced by the new paperback market. 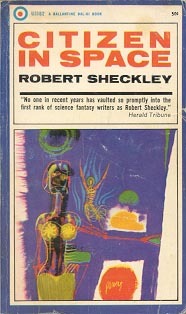 Sheckley had already started a series of well received novels, among them "Journey Beyond Tomorrow" (1962) and "Dimension of Miracles" (1968). However, he remains best known for his short stories. At a time when science fiction was just starting to grapple with the social implications of technology - from atomic bombs to missile-carrying rockets  he turned a satirist's eye on the genre and its concerns. Like Ray Bradbury, he was interested in the scientific apparatus of science fiction - space travel, time travel, extrapolated futures - only so far as it served his purpose. While Mr. Bradbury poetically mourns the failure to live up to our dreams of the future, Mr. Sheckley mocked the self-delusions that lead to dreams in the first place. He reveled in the freedom the genre afforded him to dramatize the fears and anxieties of everyday life. When he wrote about the war between the sexes, he conjured a future in which disappointed lovers had the legal option of using real bullets to express their anger. When he wrote about alienation as a state of mind, he sealed the reader in an endless loop of disaffection that reduced the outside world to a hallucination wrapped in an illusion. Because he leavened his darkest visions with wit and absurdist plotting, he is considered one of science fiction's seminal humorists, and a precursor to Douglas Adams, whose "Hitchhiker's Guide to the Galaxy" (1979) seems to take place in a Sheckleyan universe. But Mr. Sheckley's work is darker than Mr. Adams's; the smiles he evokes leave a bitter taste on the lips. A better comparison might be to Kafka, a fabulist who could never understood why his friends didn't laugh when he read his stories to them. In the eighties Sheckley was fiction editor of Omni magazine for two years. He also continued his "Victim" series of novels. In the nineties he collaborated with Harry Harrison and Roger Zelazny. Sheckley's work has been translated into many languages, and he is especially popular in Italy, Russia and Eastern Europe. Films based on his work include "The Tenth Victim" (1965) and "Freejack" (1992). Those unfamiliar with his work might like to start with "Dimension of Miracles" (perhaps his finest novel, now available in the omnibus volume Dimensions of Sheckley) and The Robert Sheckley Omnibus (an excellent collection of short stories from the 1950s). This biography contains extracts taken from two excellent obituaries. One from the New York Times by Gerald Jonas, the other from the Oregonian by Mike Francis.